Asian Aid founder Maisie Fook with some of the first Asian Aid sponsored children in South Korea. If there were a story of humble and unassuming beginnings, it is the story of Asian Aid. Asian Aid’s story all began with a woman named Maisie Fook who responded to children in need. Today, more than 53 years on, Asian Aid continues Maisie’s mission. As a Child Focused Organisation, we aim to strengthen the capacity of families and communities to protect, nurture and support their children and young people as they grow and develop. “We were directed by God – the whole thing was God directed,” says Norman Long, who served as voluntary president for Asian Aid for 38 years. As brother-in-law to Asian Aid founder Maisie Fook, Norman saw first hand the experiences that led to the writing of the Asian Aid story. In 1966, after returning from Seoul in South Korea with her two adopted children, Maisie felt inspired to do more for the orphaned children she had met. With help from husband Dennis, and the Long and Hon families, Maisie registered Asian Aid to get the shipping concessions needed to send warm clothes, patchwork quilts and rugs to South Korea. And with a budget of just two thousand dollars, and no paid staff, Asian Aid was officially established – as a pure act of faith. And the word about the work began to spread. In 1968, Helen Eager joined as a volunteer, and has been involved in Asian Aid’s work ever since. In 1977, Asian Aid began serving in Bangladesh where they helped save and establish schools and create sponsorships for children. Over the next ten years, operations diversified and the agency took on more schools in India and Bangladesh, started supporting Sunshine and Elim homes, and began sponsoring Nepali children in Indian schools. 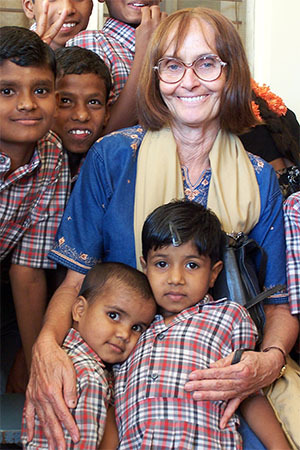 Helen Eager and sponsor children in India. This decade saw a steady increase of income, progress and change, as a result of hard work, frequent fundraisers and promotions. By 1987, Asian Aid was sponsoring 3,680 children from India, Bangladesh, Korea, Nepal and Pakistan. By 1989, when Maisie Fook retired, the whole operation of Asian Aid Organisation shifted to an office in Wauchope. Here, Kerryn Patrick, became Asian Aid’s first paid employee, guided by Helen Eager, who oversaw the whole of the operation, continuing on a volunteer basis. This decade saw Asian Aid expand its operations to include schools for children with vision and hearing impairments, leper colonies, and health clinics for women in rural Nepal. Asian Aid also helped establish Zenith Academy in Nepal, and in 2002 became recognised as an independent ministry supportive of the Seventh-day Adventist Church. During this decade, Asian Aid also employed its first Chief Executive Officer Sharon Heise, and sadly paid tribute to founder Maisie Fook, who passed away in 2002. 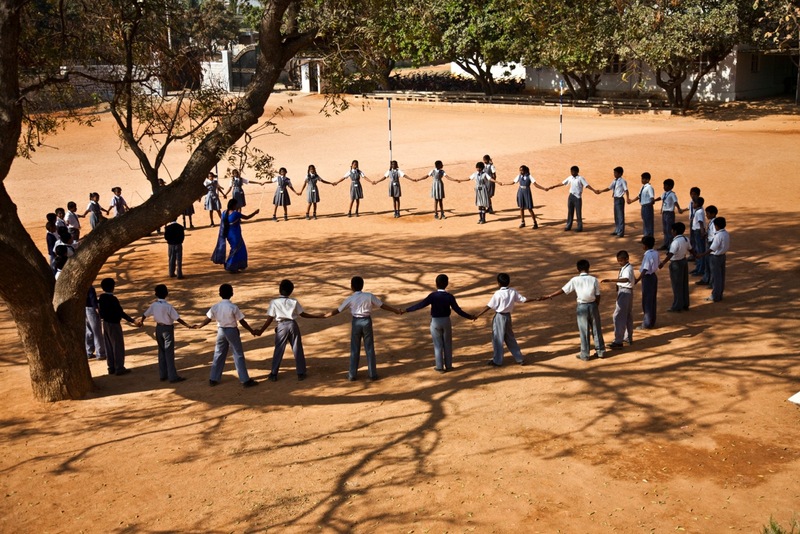 This decade saw Asian Aid’s work extend into Sri Lanka, Indonesia and Thailand. With increased overseas partnerships, a dedicated supporter base, and committed staff and Board members, the quality and diversity of work expanded significantly – reaching over 44,300 people. As we celebrated 50 years of giving and growing hope, we did so with humility and gratefulness for God’s divine guidance. Remaining true to our values and mission, Asian Aid looks forward to partnering with you to continue creating stories of hope and transformation – through Child Sponsorship and meeting some of the most pressing needs with which we are confronted. *Asian Aid would like to acknowledge and thank Dr Robyn Priestley for volunteering to collate this information. Become a change agent for a child and their communities. The Australian Council for International Development (ACFID) is the peak Council for Australian not-for-profit aid and development organisations. Asian Aid is a signatory to the ACFID Code of Conduct, which is a voluntary, self-regulatory sector code of good practice. As a signatory we are committed and fully adhere to the ACFID Code of Conduct, conducting our work with transparency, accountability and integrity.